So I want to start with my development progress since I have been hard at work recently. I have been working on securing a virtual server which I recently purchased from Linode.com. This is the first time I have ever used this and I spent quite a bit of time doing this. My aim is to use this virtual server to keep all my future developments here so I can monitor precisely what is going on. Although it does require a bit of technical knowledge to get around to places, but it was rather fun just getting to understand it. The server seems to be stabilised and now moving forward to creating my web servers onto it. I have 3 in total so I need to secure those. This server has the capability to do much more and I plan to use it to its full capacity! So lets move onto movies… After a lot of waiting around, I finally sat down to watch the entire Fast & Furious collection (only the 5 movies… The 6th one is on hold until the DVD is released)… I think it was a good set of films but the fact that it was rather a messy transition between 1-3 but went back on the story at 4-5. But 2 was more of comedy and 3 was just a whole new story with new characters which rather put me off the whole collection altogether. 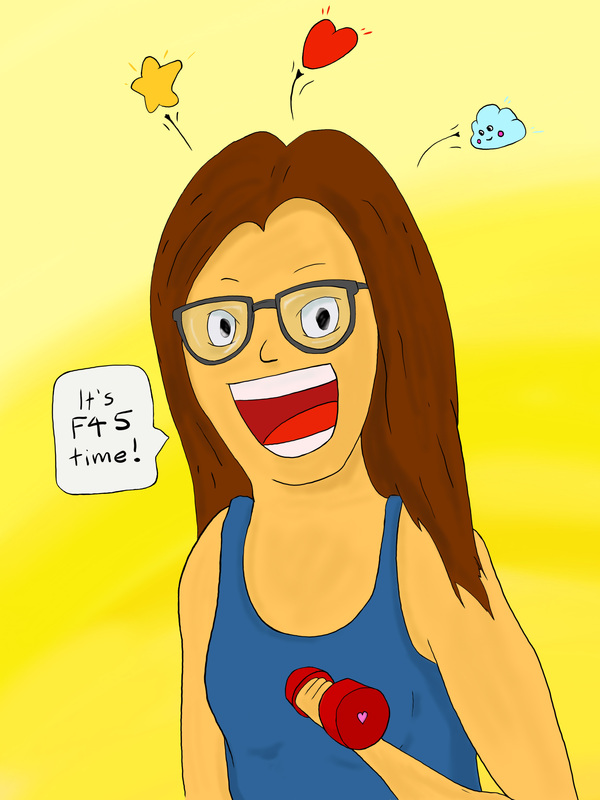 In my opinion, I think the 5th was probably my favourite one. I hope to work more on my blog so I hope you enjoyed this one. There has been a project that I have been involved with in an upcoming website releasing a version shortly. The first version of the website will consist of the latest news in gaming and will keep you up to date with the upcoming events such as the long awaited E3! We are open to feedback as well so if you also have ideas, please let us know and we will be sure to note it down. 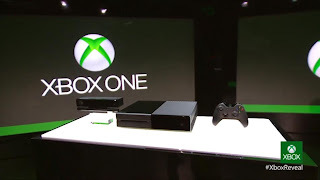 The name “Xbox One” felt as though they were going backwards… There was a big number “360” at the end of Xbox and now they want to minus 359 from it? I don’t know but to me, it feels like a downgrade to me. The presentation then moved onto living room activities. From what I gathered, they seem to want navigation through TV, movies, music and games easier just with a few simple voice commands. 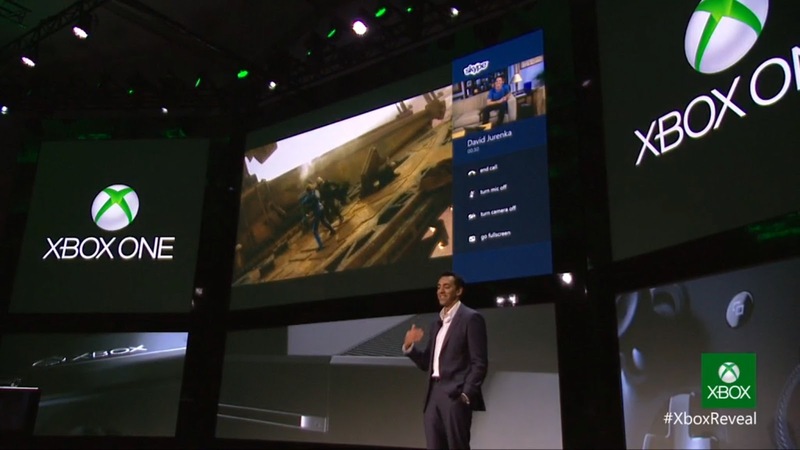 Also, they introduced Skype into the mix. It seems as though I was looking at the Windows 8 interface since the Skype call was taken on the side and had the ability to also watch Star Trek. But with Skype integration, that is what made it interesting. One thing I really loved about PC gaming was that I could video call on Skype with one monitor and play games on the other. 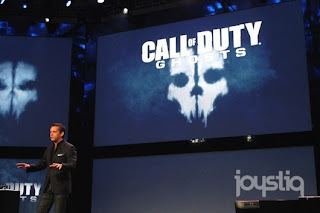 Then there was a brief overview with EA Sports, Quantum Break and Call of Duty: Ghosts. Of course I expected no game line up since they did specify before hand that the games will be announced at the E3 Expo. Quite honestly, EA Sports always deliver the same and expected games so to me, that is no surprise. Quantum Break was completely baffling! Although the story line of this game remains a mystery, it looks rather interesting. Finally, Call of Duty: Ghosts looks more or less the same as their previous games but the graphics are a touch better. So the presentation leaves me with the following opinion. It wasn’t a full disappointment but the big point is that the Kinect will be sold with the Xbox One at launch which is a good thing. With the game line up coming up, there really isn’t much to say just yet but with Skype and TV integration, it makes the console worth having. The controller is also kept consistent which I don’t see a problem with. Mistakes are made when a certain action is done but then it is followed with a judgement by either yourself or someone else right? So in that case, why do we allow ourselves to consider it a mistake? We are our own worst enemy! Some people say that they don’t live in regrets but truth be told, I think we all have one or more regrets if you analyse it carefully. But don’t let it destroy the person you spent building. Lying to yourself just means you’re living a life in denial. Personally, I cannot sit and say I am a perfect person. I just feel as though there are people who are just so afraid in making that “mistake” which could be the very same opportunity that could make you a stronger person. If someone is telling you that you can’t do something, don’t let them take you down! It’s your life and even if you make that wrong turn, at least you tried. I am still trying to learn this methodology. As days turn into weeks and weeks turn into months, I keep ending up in a spiral however, as I write this, I feel optimistic that I may just turn it all around in an instant… Nowadays, I use these mistakes to analyse why others judge them as mistakes. I don’t know about you but I’d like to redefine that very definition to a positive meaning rather than that negative vibe… Easier said than done but if we are given second chances, then let’s change it! I suppose what I am trying to get at with this post is that life is tough when people judge you and you are taken down from their comments when really, it doesn’t matter at all. Sometimes, they can be right but if you take all judgements to mind, it can take a big chunk of spirit from you! It has been a while since I have wrote a personal log in regards to what I have been up to so I thought I would write it out. Mind you, there really is not much to put down but let’s go for it. So Dead Island: Riptide finally came out and I got to play with my brothers. Seeing that we were playing in different timezones, one end were feeling tired and the other was wide awake… I was on the end of feeling exhausted but as we only played it once so far, it is enough to give out my opinion. Dead Island takes place literally after the first game and to be honest, they did a good job in keeping it almost the same but it did feel a weeny bit slower. However, it was the first time playing on the Xbox version since I played on the PC in the last game so maybe that could be the difference? The characters were the same which made it feel like they made no effort and as my brother said, there really was no point in creating a whole new game for this as the models were the same and possibly the better graphics (a touch better…). But I think I’ve judged it too soon so until my next gaming session, that is where I may can give a full review upon it but so far, 6/10. I started playing the guitar and it has given me a exhilarating feeling knowing that I have finally picked it up after letting it pick up so much dust! I am currently just looking over YouTube for tutorials and keeping it simple. It is hard for me to switch chords but I am getting used to it though. As you’ve noticed, these are all home activities and to be honest, I have been at home most of the times to catch up on everything. Keeping a strong focus on projects is my main priority! But I will be changing my blog really soon. Keep a good look out for it. My days are beginning to become productive… I can see that when reading my post out loud, I feel a slight relief knowing that at least something is being done. It is not going as fast as I expect to do it but at least I am doing it. This has been a very delayed blog post and I am hoping I will sit down to write more again. Things have been so difficult lately. Project development takes a big chunk of my time but will probably get back to it. Ever wondered whether you are being forced to follow a line? Lately, its been a zombie-like life. Maybe because its just the fact that I am working from a 9am – 6pm job, coming home and feeling drowsy to do anything else. Its strange but before, I could stay up until 3am, wake up and be ready for the next day. It has not been the same for quite some time… I even get a little annoyed with myself just for sleeping early! What is this sudden eagerness in myself to try force to do something productive? However, this is not just me... There are a few others who also suffer the same issue. But this all comes down to a simple thing called scheduling… Recently, I have felt a little stressed just trying to think what I need to do on a day to day basis and even though its only 7 items or so on the list, just the mere thought of it creates a stress ball in my head. But when I jot it all down on my notepad, it feels like that stress ball dissolves! In my opinion, there is no quick way to step out of this line but my best solution is to prioritise yourself. It doesn’t sound hard but it really is what it is. For me, I just need to schedule my time towards the things that really matter to me. But of course, the answer doesn’t lie in scheduling. An issue can also be the fact that others do not want to take risks but it means you need to be a little spontaneous. One thing that is worth watching and can be inspirational is Yes Man. However, watching this film didn’t mean that I changed my style immediately… It took me a while to jump into this field. Basically, I came to a point where I was stuck and wondered to myself what I should do next. Then a friend of mine asked me if I wanted to try out this club. I wasn’t much of a clubbing type so I almost said no to this occasion but it turned out I asked myself what do I really have to lose if I go? And with that question answered in my head, I replied with a positive YES! I think that when I did this, I opened my mind a bit and without any regrets, I am absolutely glad I did that. Just makes me want to do more. I can’t speak for everyone but I can say that sometimes, you need to get out of your comfort zone in order to find out what you really enjoy! 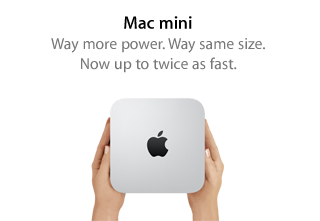 My Mac review (Using it for a good year). Mac (also known as the Macintosh) concentrates upon visual sectors. In my opinion, Apple works a whole lot on making things look pretty and this is probably what pulls people in. The graphics are smooth, the colours makes my monitor brighter and the animations are amazing. Oh and I can create apps for the App store too! Bad points? Well, there are several I’d like to jot down. 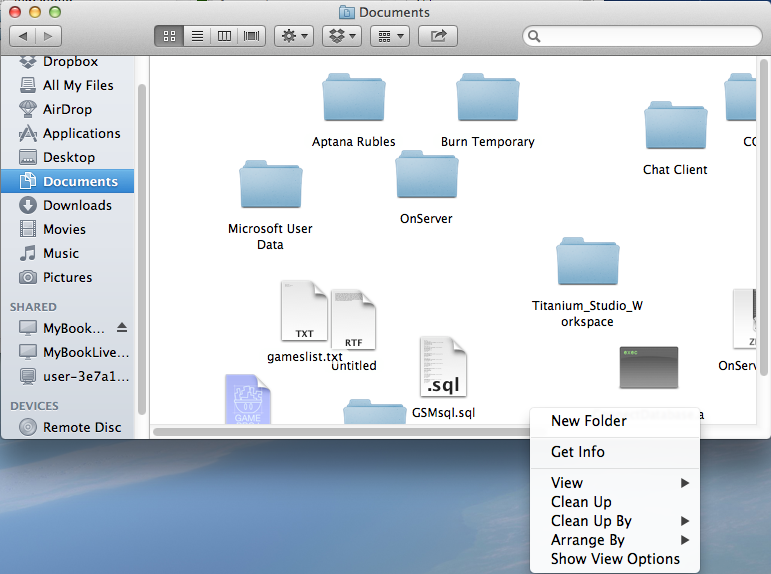 The folder management is terrible! The tidying folders in icon mode is a mess! There is no auto tidy or anything. You have to manually tidy up every time! The only time when it does it automatically is when you right click and click on “Arrange By” and then when a new folder comes in, it ends up messy again. I know it’s not much of an issue however, it does bother me to always having to right click and manually indicating to tidy it up for me. This is where I result in the columns view and even that its not perfect! To go back folders, I have to scroll back? But hey, its less painful. I guess the next would be the shifting to other open applications. By using the Cmd + Tab keys, I can access to my opened applications but what makes it a failure would be Apple makes it a Grouped Selection! What does this mean? Well, when you switch over to Google Chrome, it shows you ALL of the windows you have opened with that particular application! 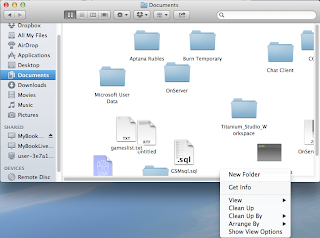 So say for example, I have a thousand windows opened for the Finder, when I switch off to another application and decide to come back, it will open ALL RELATED Finder windows and then try and look for the window I really want. Before was a huge issue but gaming was very limited for the Mac. I can’t say if it’s an issue now since I’ve stopped play games on my PC’s generally. But Windows was very ahead on the gaming and I did my research on Macs back then and there were not many Mac related games so that made me not want to buy a Mac. Now that I own a Mac, this may have been the reason why I stopped gaming on the PC just knowing the fact that gaming is limited. Why do I have a Mac? Just because I have the capability of creating apps for the App Store. The Home and End buttons are a nuisance! So I’d like to specify that I am using a Microsoft keyboard on a Mac machine but still… When I am on Dreamweaver, I am programming and the Home and End buttons work correctly but then when I switch over to Flash or even Chrome, these buttons go to either the top or bottom of the page!? There are times when it even works on Chrome typing out this blog post so thinking logically, the shortcut keys to get to the beginning and end of the line is the Cmd + Arrow Keys which is fine by me. But whats next? Dreamweaver doesn’t want to go to the beginning or end of the line with these keys! So WTF!? Make up your mind! Its either one or the other. Finally, the access to applications! So on a Mac, you see a docking station at the bottom of your screen. That’s great since it is so easy to access. So what’s the problem? Well, you have to assign what goes on that docking station so how do I access my newly installed applications? So there are 3 ways I can get to them! Either use Apple’s Launchpad displaying all the applications in an iOS themed display, using the Spotlight located on the top right of the screen and typing the application or navigating to the Finder and click on “Applications” there. I suppose my problem is just that there is no easy access to browse my applications. 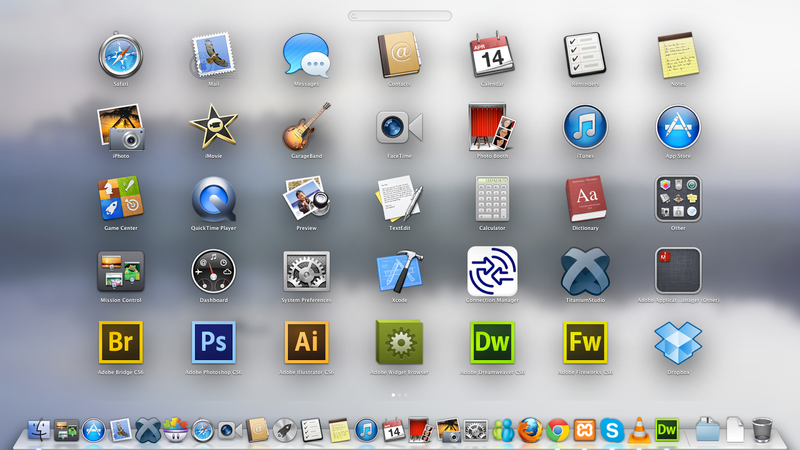 The Launchpad is pretty but the scrolling through applications in that format is a waste of space. iPads and iPhones need to do that since it has limited spacing so why integrate it onto a bigger screen!? The Spotlight feature I cannot browse through the applications I have since I have to type it. There are times I just get frustrated remembering what application I just installed and with the text field blinking at me just makes me want to bang my head! So I use the Finder. 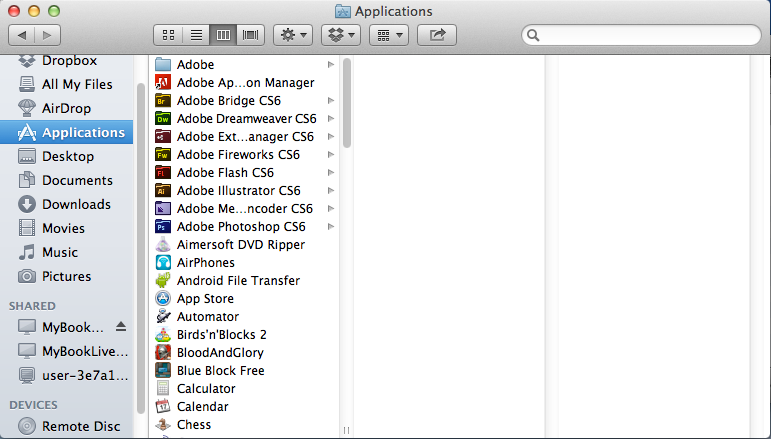 It displays my applications in a list format which is a great view and can browse through them. The problem here is that my attention diverts elsewhere as soon I click on Finder since the default view is All My Files resulting that I end up looking elsewhere and forgetting the main reason why I am on the Finder in the first place. So my review as a whole? These issues have got me at an uneven state and truth be told, the Windows platform beats Apple but just waiting for the right time to switch so I can use this for a little while longer. If I was to recommend an operating system, I would suggest Windows definitely! DONE! Battlefield 4 – Prepare 4 battle! The game had a big hype from people and in support of this, I’m excited! The 17 minute gameplay now available on YouTube shows a whole lot for campaign mode. Truth be told, I started at Battlefield 3 and kept in the multiplayer region so I’m not really sure if I can compare but I will put my opinion into it anyway. 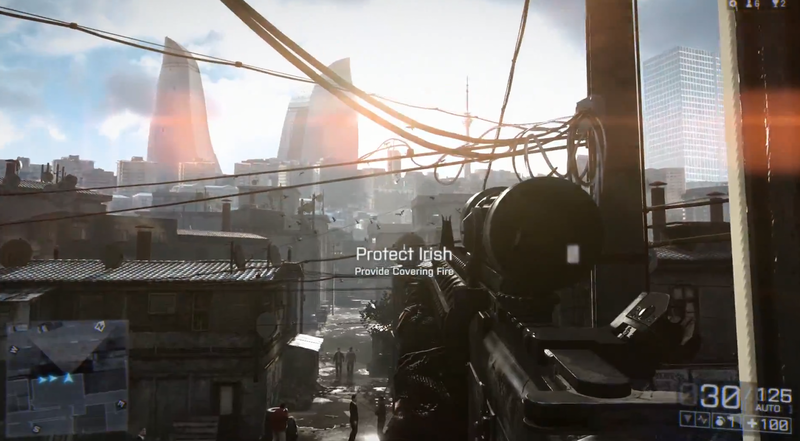 For starters, the graphics have never disappointed me since the BF3 era. The environment looks spectacular thanks to the Frostbite 3 engine! The lighting is just so amazing. The way how the glare of the sun and many other factors just keeps you immersed into the game. 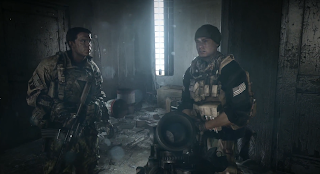 Sometimes in Battlefield 3, I would just stop and stare at the little details in the environment for a while only until the random individual just comes over to knife me… Not cool! And to top it all off, there is going to be a dynamic weather system!? Now that is going to be something to look forward to! In compliments to animation, when the characters are talking with each other, their body language indicates they have a history which in my opinion, most games does not successfully grasp very well. But don’t get me wrong. 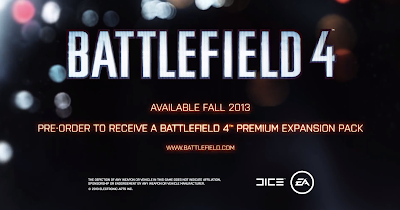 I’ve seen many games achieve this but in comparison to BF3, it has improved. It seems like the destruction is a big hype in this game. I never got to play Bad Company 2 but reviews and all indicated it was known for the destruction and with that being said, it has been confirmed that destruction is coming back into BF4. 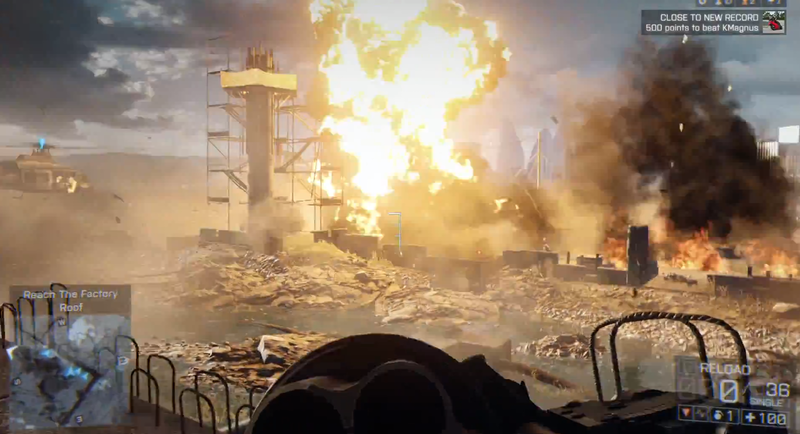 Now I thought that BF3 was enough destruction as it was but there is more!? Knowing me, I am definitely looking to do that for certain! Apparently FULLY COLLAPSIBLE BUILDINGS!? Got to try that!! These are the main pointers I am looking forward to in regards to this game! 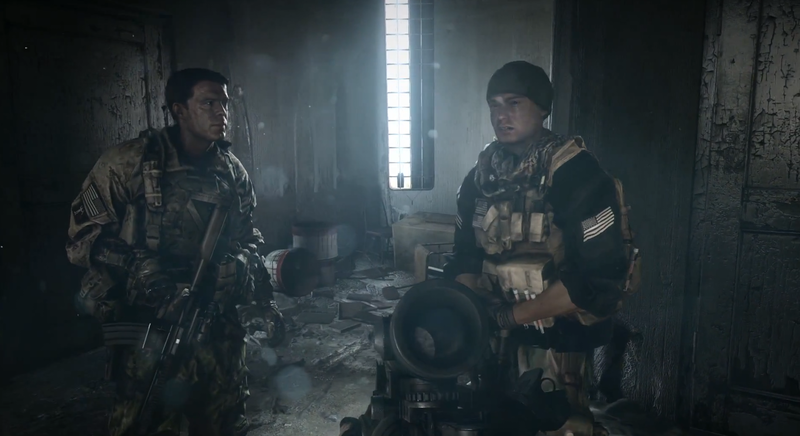 Mind you, when I started watching the 17 minute gameplay of BF4, it made me start playing the campaign version of BF3 and I am really starting to love it! With that being said, I may just run off to play some more now! Thank you DICE for creating this EPIC game! I started with what they used to call a “brick” and a 4cm antenna given to me from my brother. This was once known as the Ericsson. That’s right, Ericsson was not merged with Sony at that time. This phone had a green LCD screen with up to 3 lines of text and the network provider one2one. Not heard of it? That’s because it changed to T-Mobile and now changing again to EE. But since I was a young one, I had to settle with a pay as you go sim card. 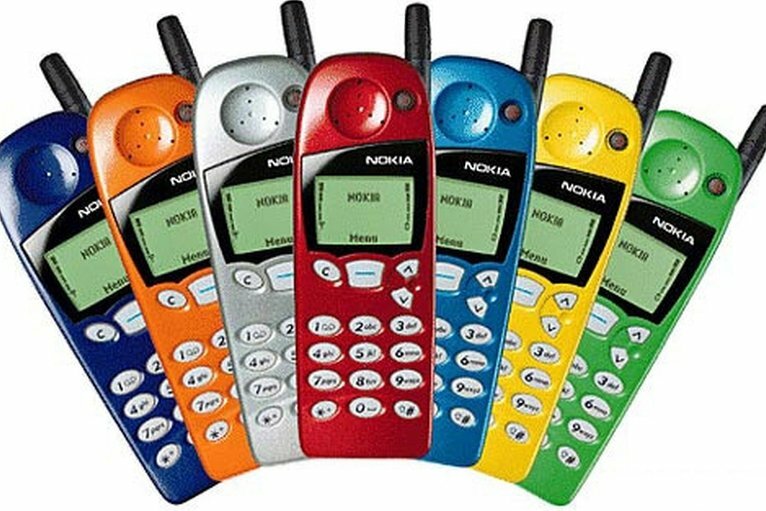 At that point, text messaging wasn’t even integrated with this phone and everyone else was holding the hip phone Nokia 5110 that had the amazing feature of changing the front face! Oh and they decreased the size of the antenna to 1.5cm. But I couldn’t afford this face changing phone so what could I do because everyone was texting and I couldn’t. Then I discovered the new update that you can text but you need to go through a series of steps. Awesome right? It took about 3 days to setup involving a call to one2one and configuring some settings on my Ericsson. Finally, with a load of frustration, the phone had texting however, it was one liner! In other words, I had to type my text out on one line scanning my wording from left to right! It was painful but I had no choice since money was a huge problem. Skipping a year or so ahead, I finally saved up £100 to grab my first ever phone! 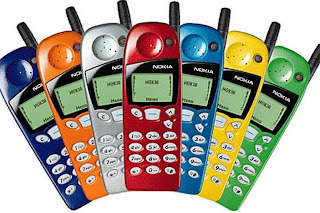 So my choices were either the Sony or the Nokia 3310 (at that time, they were the hottest phone on the pay as you go market after the Nokia 3210). This was a no brainer since I was in need of the game Snake! The game ONLY available for Nokia. 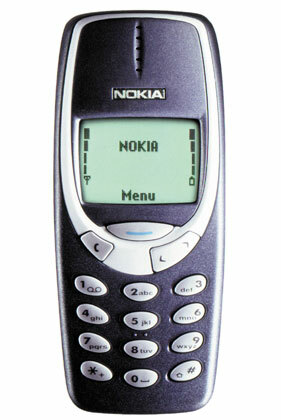 The Nokia 3310 with the customisable feature of back and front faces to be changed! Whatttt!? Mind blowing change by Nokia! And not only that, the antenna within the phone!? And to top it all off, it was twice as smaller and lighter too! These were the best features ever! And to overkill, I had the ability to text on 5 lines! 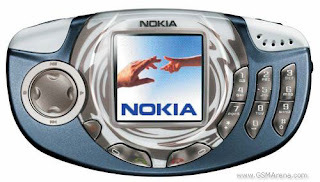 From there, I had this phone for a while only until I heard that another Nokia phone was released which had the similarities of a portable gaming device; with a d-pad on the left side of the phone, the numbers on the right and the screen in the middle. To top it all off, it was a colour screen! Now that was revolutionary! Although, the only game I really played on this device was Snake (yes, that game was still very good, the d-pad made it really easy to control). Those years feel like a long time ago and now, the phones have gone bigger and all touch screen phones! I think we have established that size does not matter and in fact, people want even bigger (sounds so wrong)… With phones going off as cheap as £100 or less for a touch screen phone is a bargain! This phone is somewhat great but since I was an iPhone user, I cannot adjust to it just yet. I guess I am taking some time with it before I can say I “love it“. Too soon to tell. What will be the next gen phone! ?